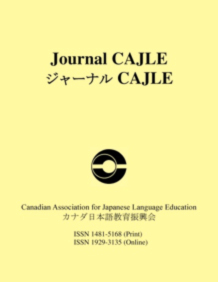 Journal CAJLE was first published in 1997 and the peer-reviewed journal is now published online annually in summer, as a multidisciplinary forum for communicating new information, recent research results, and practical experiences reports, concerning Japanese language education, immersion programs, and bilingual education, Japanese linguistics (including second language acquisition), and Japanese literature and culture. Submissions for the journal are accepted at any time; however, submissions accepted by December 1 are considered for publication in the following year’s volume. For further information and instructions on formatting your manuscript, please consult the Submission Guidelines.